Sometimes we don’t have the privilege or luxury of going through our issues in private. Let’s take a look at David. So David put the armor on and clinked and clanked around the king’s tent. This tells me we all have our own armor. We don’t need to wear anyone else’s. Just be yourself. You have your own style. As long as you take off the giant’s head, who cares what method you use? It may be behind a pulpit or it may be in the mall; you may wear a suit and tie or jeans and a hoodie—who cares? Just swing the Rock, Christ Jesus—and carry it around as a reminder that it’s only the Rock who slays the giants that stand in our path! 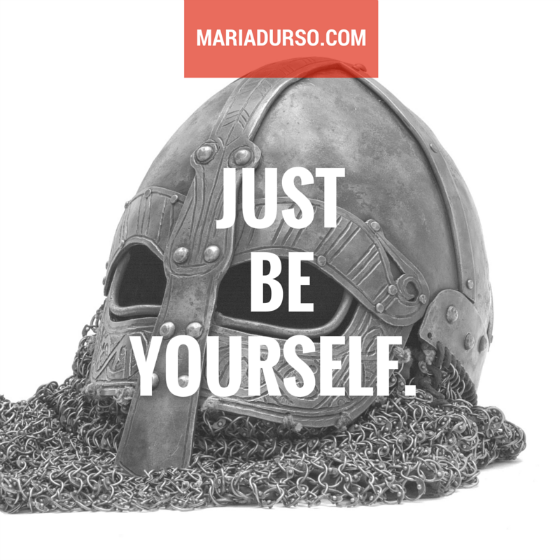 Today, instead of wearing someone else’s armor—give yourself permission to just be yourself. This is such a great reminder for the children of God. Thank you. In a world of fake and trying to find meaning, how precious it is to know that God only asks we be real and true to the way he made us . AUTHENTICITY it wins every time!